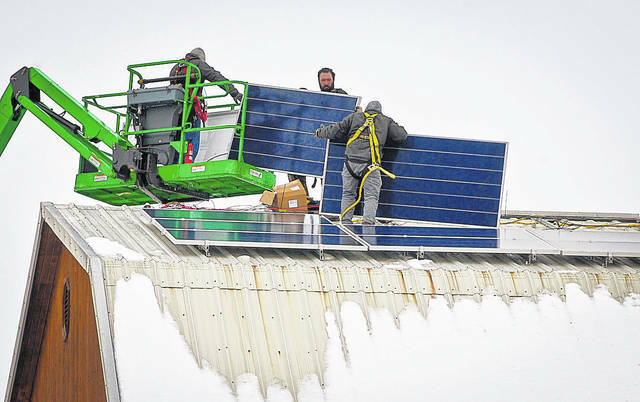 Battling the elements to install an array of 156 solar panels on the roof of Stratford Ecological Center’s barn was no easy task for a crew of technicians with Third Sun Solar from Athens. “They had a snow blower up there to get all the snow and ice off of the buildings,” said R. David Hoy, development director of Stratford. On Friday, the crew gained a break in the weather to start putting the panels into place on the barn and machine shed. R. David Hoy, development director at the Stratford Ecological Center, points to the $75,000 spot on the chart used to track the amount of donations received for the center’s solar array project. Hoy said the mark was reached this week, but it hadn’t been colored in yet. Stratford Ecological Center’s plans to become energy self-sufficient through solar power became a reality this week as 156 solar panels were installed on two buildings. 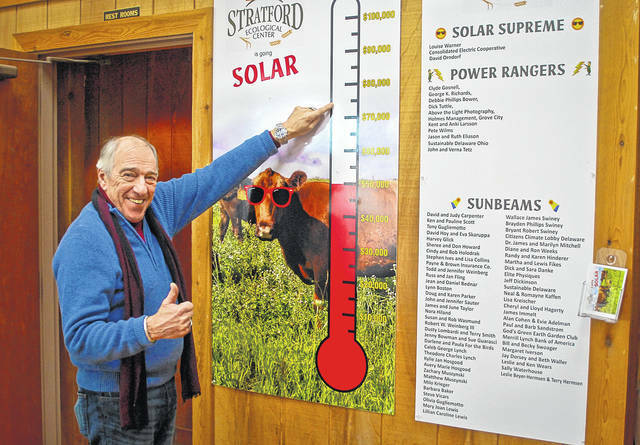 According to Hoy, Stratford’s fundraising campaign to raise $115,000 has reached $75,000-mark in donations to help fund the solar panel array. “After our solar panel installation, we will be producing 70,000 kilowatt-hours annually of our own electricity, which represents 90 percent of our total electrical needs — via the AEP net metering program,” Hoy said. Hoy said the center is working with Third Sun Solar from Athens, Ohio, on the installation. According to Jeff Dickinson, the center’s executive director, there were many plans and designs in the approach of installing solar power. Dickinson said solar has taken off, but legislators and lobbyist won’t get out of the way to let people use more of what they produce. Dickinson said the current state and federal laws will only allow the center to produce up to 90 percent of their electric power needs. According to one Third Sun Solar technician, the solar array requires no maintenance and even when covered in snow, the panels will produce power. According to Mark Campbell, solar technician, there are no modifications made to the roof of the buildings. He said braces are basically screwed into place, and then the panels are attached to the braces. According to Dickinson, the panels, at max, will produce 350 watts of electricity. “Of course, they don’t produce that all the time, but that’s their max,” he said. Stratford Ecological Center is a 501(c) (3) non-profit educational organic farm and nature preserve on 236 acres in Delaware County. The center’s mission is to educate children and adults in understanding relationships between living things and the environment to foster an appreciation of the land and the life that depends on it. This entry was tagged Center, D. Anthony Botkin, Dickinson, ecological, Hoy, stratford, Third Sun Solar. Bookmark the permalink.